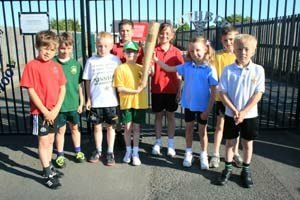 Four Amble schools carried an ‘Olympic’ torch during National School Sports Week, just 50 weeks before the Olympic Torch arrives in Newcastle. The Ashington School Sport Partnership event ran from Warkworth First School to Amble Links/St Cuthberts, to Amble Middle (JCSC South Ave) to the High School (JCSC Acklington Rd) then to Acklington, Broomhill and Druridge Bay (JCSC Hadston Rd) and on down to Ashington, linking the Partnership schools. Pupils and staff from each school delivered the torch to the next, either running, cycling or walking. 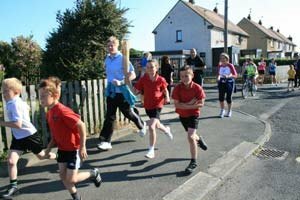 The arrival of the torch at each school also kick started a sports event for the rest of the pupils. Involved were Warkworth First School, Amble Links First School, St Cuthbert’s First School, James Calvert Spence College (Acklington Road Campus), Amble Middle School, Acklington First School, Broomhill First School, James Calvert Spence College (Hadston Road Campus), Red Row First School, Grange View First School, Ellington First School, Northumberland Church of England Academy (NCEA) William Leech Campus, NCEA Jackie Milburn Campus, NCEA John Dobson Campus, NCEA Robert Stephenson Campus, NCEA Richard Grainger Campus, St Benedict’s Middle School, NCEA Thomas Bewick Campus, Hirst Park Middle School, NCEA James Knott Campus, St Aidan’s First School, Ashington High School, Wansbeck First School, Bothal Middle School and Pegswood First School. The event was organised to raise awareness of the 2012 Olympic and Paralympic Games in London.